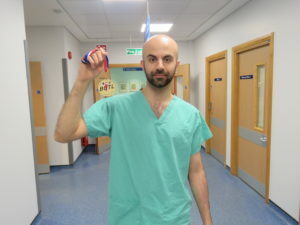 A surgeon at the Trust which runs Shropshire’s two acute hospitals has won a gold medal at the British University Taekwondo Championships. Shko Resool, a Surgical Trainee in Vascular Surgery at The Shrewsbury and Telford Hospital NHS Trust (SaTH), which runs the Royal Shrewsbury Hospital (RSH) and the Princess Royal Hospital (PRH) in Telford, came through six rounds to win his 70kg sparring event. Shko, who trains twice a week at Universal Martial Arts in Shrewsbury, as well as at Aston University, also claimed a bronze medal in the patterns category. He currently undertakes a Post Graduate Degree in Health Education at the University of Birmingham. The 29-year-old, who took up taekwondo when he was 15, said: “I trained incredibly hard for the championships so was absolutely delighted to win my sparring event. Shko will now retire from competitions to concentrate on his career in the NHS. He said: “I dedicated so much of my time into winning the gold medal that I now want to channel my energy into my career. The reason anyone gets into this line of work is because they have a passion for helping others by delivering excellent patient care, and that’s exactly what I want to do. “I love my job and the training I am receiving at SaTH is excellent. I am learning every day and there is no denying that taekwondo has given me the skills to remain calm and relaxed in what can sometimes be a stressful environment.